Oh hi everyone! 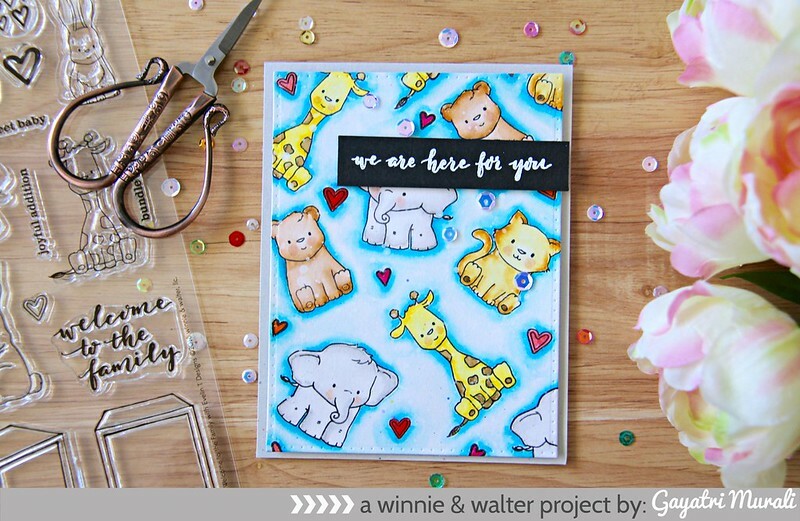 Hope you have been enjoying all the projects from Winnie & Walter new release. Today is the last day of premiering the new products. 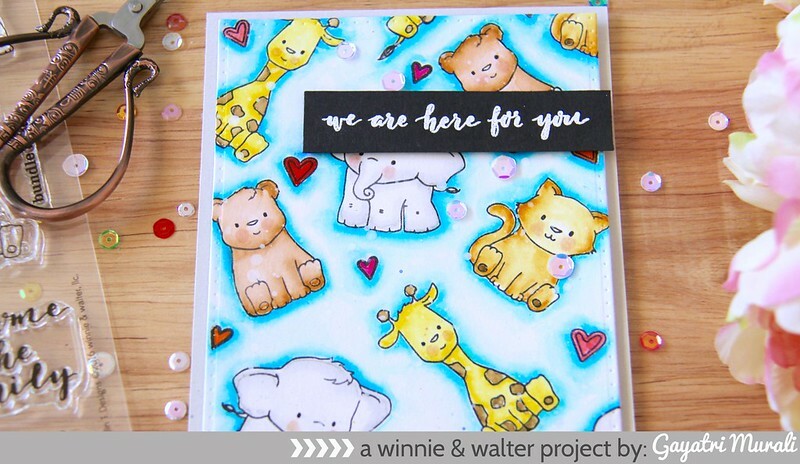 I am showcasing new stamp set called Welcome to the Family with Evelin T Designs. This stamp set also has coordinating cutaways. I did not have the cutaways in time to make my card. So my card does not feature the coordinating dies. Anyway here is my card. 1. My card base is a light grey cardstock. 2. I die cut a panel using the largest rectangle die from Essentials: Katharine Cutaway and Bristol paper. 3. I stamped the cute images from Welcome to the Family stamp set using black ink and filled in with some hearts images. I used Versafine onyx back ink and heat set it. 4. The images are coloured the images and background using Zig Clean Brush Pens. 5. I adhered this panel on the card front using foam adhesives. 6. The sentiment is white heat embossed on a strip of black cardstock and adhered again using foam adhesives. 7. I embellished the card with sequins. Welcome to the Family and The Big, the Bold and Baby stamp sets are an absolute must have in your collection. This set has so many cute images of animals and the elephant has mirror image as well. Perfect to make spinner card and cards for twins. I am looking forward to using the coordinating cutaways and creating more with this stamp set. All the new products premiered over the past four days are released today at 10PM CST at Winnie & Walter Blog. Oh Gayatri, this card is just way too CUTE! LOVE this set! I love how you coloured blue behind the animals, makes the card pop even more!